All of our puppies will be started on litter training, here are some helpful ways to keep it going. When you first get your puppy home, its bladder is probably the size of a peanut, and it will try to pee every time your back is turned. So the trick here is to watch your puppy constantly. It's a pain, but the more you actually catch your puppy in the act of trying to go, the faster the whole process of housebreaking will be. It's best to only let your dog roam around in a small area at first until they have the basics down. In this respect, crate training will be your best friend. Every time you see your puppy start to sniff and circle, grab her and run to her litter box. Very young puppies especially almost always have to go after they've had a nap, so if you're having trouble catching your puppy fast enough, try putting her in her box preemptively every time she wakes up. If your are at work all day, or will be unable to let your puppy out of her crate every hour or so to let her use her litter box, an alternative method is to find either a small room or section off a small area in the house using a baby gate. Place your puppy's crate, food, water, and litter box in a way so that there is as little floor space as possible. Your puppy will not want to go in its crate where she sleeps and plays, will not want to go where she eats and drinks, and so will hopefully come to the conclusion that she should use her litter box. Positive reinforcement is the fastest method of training your puppy. Every time she successfully uses her box, act as if your puppy has just discovered the secret to world peace, preferably with lots of petting and talking in that ridiculously happy baby voice that all dog owners have. Treats are even more effective. Plain Cheerios make excellent treats as they are small enough for most little dogs to chew, they are cheap, and they probably won't ruin your dog's appetite. As your dog gets older and has fewer accidents, you can increase the size of the area your dog is allowed to run around in. Each time you do this you will have to spend a couple days watching your dog vigilantly, catching her every time she makes a mistake and tries to go behind the potted plant, but if you do it slowly enough, with time your dog can roam the whole house or apartment and still know to go to her litter box when she has to. Here are a couple of good ways to set up your puppies area. 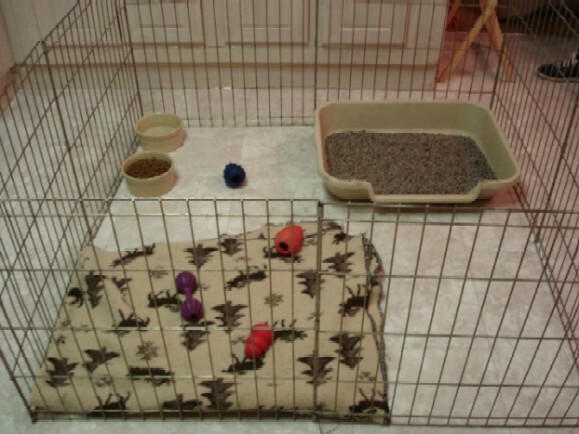 Start with the more confined area and then give them more space as they get better at getting to the litter box.